For as much as I talk about and praise the recent resurgence of adventure games under a more modern design philosophy, whenever there’s a release that sticks to the roots of the genre, somewhere deep in my mind, my twelve year old self smiles and rubs his hands, gingerly. As a fan of adventure games since the mid ’90s, I couldn’t help but be curious about Quest for Infamy, a Kickstarter game that was first introduced to me at E3 this year. For starters, Quest for Infamy looks and plays like a title from that particular time, when fiddling with sound cards and single speed CD-ROM drivers was only the beginning of the foibles of playing an adventure game. And while some may cringe at the idea of diving into a new ‘old’ Sierra style game nowadays, ‘Infamy is stealthily very modern. On one hand, the “de-make” checklist for this game is quite thoroughly filled out. It’s got a very colorful and pixilated looking and sports the pre-Telltale Games mentality of adventuring. That is, an inventory full of stuff that’s not always useful, puzzles that actually play out like puzzles – you know, the ones you actually have to figure out. Still, if you don’t want to have to fry your gray cells too much to figure out any particular conundrum, there are alternative options to solving them. Some are incredibly on the nose and spell out exactly what you need to do, while others are more smartly implemented, allowing you to do something else entirely, with the same result. Granted, there are moments where ‘Infamy slips on the Sierra punching glove and knocks you out to a game over screen, but thankfully enough, it’s easy to reload a save game and try again. And unlike Ms. Williams’ works, there aren’t any possibility of breaking sequence and locking yourself out of the game, something that used to be very common in games from that time period. For better or for worse, Quest for Infamy is almost fully voice acted, save for a couple of throwaway NPCs. Results are very mixed. Some of the voice samples sound considerably grainier and of much lower quality than others, for one. On the other hand, there are only a couple of moments in the game you’ll run into these, since most of the recordings are crisp and sound fine throughout. Even though the concept of branching paths is nothing revolutionary in 2014, as a game emulating a long past period in the adventure genre, Quest for Infamy does it admirably. The crossroad in character development comes really early on in the game. three very distinct paths that lead to playing the game very differently all the way ’til the end. Regardless of your path, the ‘infamy’ in the title plays its part quite well. Many of the interactions you’ll run into in Quest for Infamy give you different options to choose from, that usually range from being a jerk to being, well, quite mean and evil. And while I did not run into any earth shattering consequences to some of Rhoem’s actions during my playthrough of the game, it still felt great to be bad in most of these situations. Rhoem is quite a character. He’s meant to be treated as a womanizing jerk who was run off of a neighboring kingdom, but thanks to quite a bit of development, you mind find yourself liking the guy by the end of the game. It certainly helps that he’s (or in this case, you’re) constantly offended and bullied by a fully voiced narrator. His quips are very well written, and although often crass, they managed to make me laugh all throughout the game. One specific section dealing with indie game design budget in particular shouldn’t be missed (note: be sure to click around a lot down at the docks!). The only real section of Quest for Infamy that is likely to annoy some players is the combat. Depending on the path you take Rhoem in, his offensive prowess will be a little different, but his base means of attacking enemies is always his sword. Even thought upgrades can be found for his weapon and armor the actual fighting leaves a lot to be desired and can be quite frustrating if you are caught unprepared. My solution while playing the game was to simply farm gold, amass potions and hope for the best. Since all base attacks are incredibly random and tend to miss a lot when they shouldn’t. If you choose to throw caution to the wind and jump into combat often, you can benefit from the game’s stat developing mechanic that borrows from Elder Scrolls – i.e, the more you block, the higher your stat will get; same goes for stabbing, slashing and in the case of the sorcerer path, your spells as well. While not exactly optimal, it’s a way to circumvent later headaches towards the end, when tougher enemies start coming out of the woodwork. Overall, Quest for Infamy excels at being a modern game under the heavy makeup of older times. 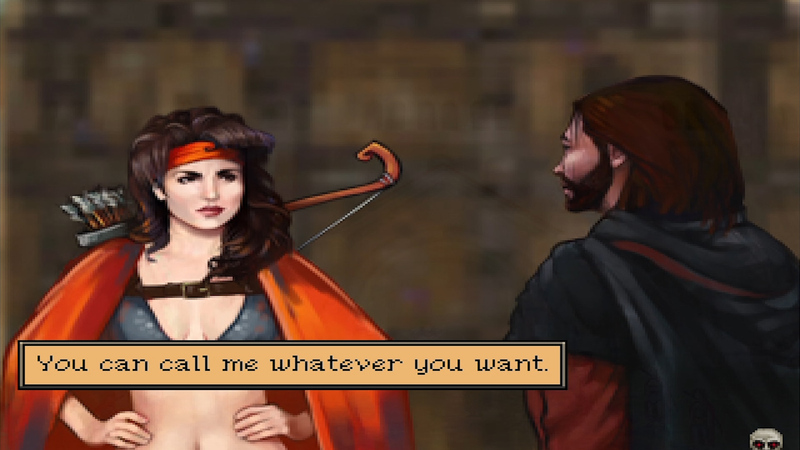 Its aim to please both the nostalgic adventure gaming audience and newcomers alike is clear. It does so quite well, hiding solutions to those willing to look for them, as well as giving the option not to do so. I also helps that it’s incredibly funny, which is always a big plus as far as adventure games go.